Everything you need to know about the MCAT in one easy-to-understand guide. What are the MCAT subjects? What is a good score on the MCAT? What do you need to pass the MCAT? Who can take the MCAT? How are the multiple MCAT scores evaluated? How should I approach taking the MCAT? This definitive Gold Standard guide to the MCAT will clearly explain what the MCAT is, what subjects are included in the MCAT, what a good MCAT score is, what you will be tested on and – most importantly – what you need to pass the MCAT. Our MCAT experts will point you in the direction of lots of free resources, as well as detailed two and three-month study guides. Let’s get started! The MCAT, or Medical College Admission Test, is a standardized, multiple-choice exam administered by the Association of American Medical Colleges (AAMC). The exam is a prerequisite for admission to nearly all medical schools in the US and Canada. Annually, over 80,000 applicants to American and Canadian medical schools submit their MCAT scores (What is a good MCAT score?). The exam has evolved over the years and, since 2015, has become primarily a reasoning-based exam – although a wide breadth of basic knowledge is required to answer the questions accurately. The MCAT will evaluate your knowledge of natural, behavioral and social science concepts and principles, as well as problem solving and critical thinking skills that are required in medical school. A good MCAT score is 127 out of 132 in any one section, or 508 out of 528 for all four sections. The MCAT is scored on a scale, with a lowpoint of 118 and highpoint of 132 available for each of the four sections. The midpoint is 125. Your four MCAT scaled scores are combined to create a total score ranging from a lowest possible 472 to a highest possible 528, with a midpoint of 500. Different medical schools have different pass rates. Medical school admission committees only use scaled scores to evaluate the MCAT component of the admissions process (not percentage, not percentile). Sounds complicated? We’ve put together a comprehensive guide to help you understand how pass rates are calculated. Calculate your chances of being accepted to medical school. The MCAT will evaluate your knowledge of natural, behavioral and social science concepts and principles, as well as the problem solving and critical thinking skills that are required in medical school. Read our detailed section-by-section breakdown of all MCAT subjects. The current MCAT is hard. The purpose of the exam is to ensure that students who get accepted to medical school not only have a good foundation of scientific facts and relevant formulae, but also the mental agility to look holistically at the sciences (take in the big picture), and yet be comfortable at critically analyzing scientific data with depth of perception (focus on the necessary details). In other words, the new MCAT is not for those who can cram four years' worth of study into three months. It is for those students who can take scientific facts and make sense of them enough to solve particular problems. To do this, you will need to stick to a study schedule. We have put together two and three-month schedules to inspire you. you are planning to apply to a health profession's school such as allopathic, osteopathic, podiatric and/or veterinary medicine. This also applies to international students. you are applying to any health-related program that will accept MCAT exam results. you are enrolled in an MBBS degree program or if you have such a degree (Bachelor of Medicine, Bachelor of Surgery). During MCAT registration, you will be asked to verify your intention to apply to medical school or to a health profession’s school. There are no academic prerequisites to take the MCAT. Students with science and non-science backgrounds are eligible to take the exam and have the same opportunity to enter medical school. Prospective students usually arrange to take their MCAT a year before their intended matriculation into medical school. If you are eyeing medical school in 2020, then you can take the MCAT in 2019 or before. Ideally, you should start your MCAT prep at least six months prior to your test date (2018 MCAT Test Dates). Since there are no academic prerequisites for the MCAT, you can take the MCAT as early as your freshman, sophomore or junior year of undergraduate studies. The best time to take the MCAT is when you are ready (read more on our blog: How to Determine When to Take the MCAT). 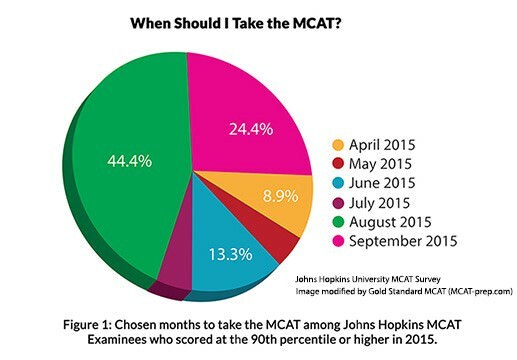 This pie chart is from a Johns Hopkins University MCAT Survey of students who sat the MCAT in 2015, and who scored at the 90th percentile or higher. The fact that 2/3rds took the exam in August and September suggests that having most or all of the summer available for MCAT preparation may be one factor in gaining a high MCAT score. You can take the exam up to three times in a single testing year, up to four times in a two consecutive-year period, and up to seven times in a lifetime. Obviously, you want to minimize the number of times you need to take such a rigorous exam, and that is clearly the value of good MCAT prep. Furthermore, medical schools will not review your application until they receive all your scores from the AAMC. ** This is an oversimplification. The ‘old’ MCAT Biological Sciences section actually did contain an unspecified number of questions that would now be considered Biochemistry including biological molecules (Organic Chemistry) and basic metabolism (Biology: glycolysis, Krebs cycle, etc.). However, the current MCAT Biochemistry also includes the pentose pathway, lipid metabolism, gluconeogenesis and other typical first semester college topics. Note: the above summary does not take into account the fact that many questions in the non-CARS sections will involve basic research methods and statistics in the passages and/or questions. The AAMC has designed the MCAT to be longer. That is, 7 hours and 30 minutes long. The table below provides a breakdown of the four MCAT sections, the subjects included in the MCAT exam, the time allotted for you to answer them, as well as the breaks between sections. You may use your optional break to go on to the next MCAT section if you are done with the previous section earlier than the required time. But, the unused time from the previous section will not carry over to the next exam section. Note: The total time does not include check-in time upon arrival at the test center. In 2012, 65 to 67 questions were planned for the 95- and 90-minute new MCAT sections which would have been proportional to the timing provided for the old version of the exam. However, for the current MCAT the AAMC has allocated only 59 questions for 95 minutes. Because of this subtle change, the new MCAT has more working time per question than the old version of the exam. This means that overall, you will have more time to read passages, consider options and make decisions about your answer choices. The MCAT started as a paper-based standardized test. In 2007, it became a computer-based test. To keep pace with the changes in medicine and science, the AAMC changed the exam again in April 2015. The current MCAT tests not only what examinees know but also how they can use their knowledge to reason. * Note: The correct answers for this section can either be found directly in the passage or by applying information from the passage to new content presented in the questions. What can you expect from the current version of the MCAT exam? The current MCAT is broad, but at the same time, it is a precision tool to assess your grasp of the sciences. Keep in mind that in real life, the boundary between sciences is artificial. A molecule does not know if it is a matter of physics, chemistry or biology. You were trained to put that molecule into a box depending on the course code. The current MCAT blurs the boundary. After all, the molecule is physics, is chemistry, can be biology, and may have psychological or sociological implications. The current MCAT sections cut across scientific disciplines (Physics, Organic Chemistry, Inorganic Chemistry, Biochemistry, and Biology) which interact in living or biological systems. The Psychological, Social, and Biological Foundations of Behavior section seeks to test your grasp of the interplay between Psychology, Sociology and Biology with the context being basic research methods. The latter is also consistent with DSM-5 (the Diagnostic and Statistical Manual of Mental Disorders, 5th Edition). The keywords for the new exam are 'foundations' and 'systems'. Just as it takes different elements to create a foundation and it takes all sorts of concepts to comprise a system, so the new MCAT will test your knowledge of how each scientific discipline interacts, interplays and influences other scientific disciplines. The current MCAT is hard. First, it is comprehensive as there are more topics included (Psychology, Sociology, Biochemistry and Statistics). Second, the MCAT sections are organized along different criteria that span all the subjects. Third, the purpose is to ensure that the students who do get accepted to medical school not only have a good foundation of scientific facts and relevant formulae, but also the mental agility to look holistically at the sciences (take in the big picture), and yet be comfortable at critically analyzing scientific data with depth of perception (focus on the necessary details). In other words, the new MCAT is not for those who can cram four years' worth of study into three months. It is for those students who can take scientific facts presented to them and make sense of them enough to solve particular problems. All of this is compounded by the fact that the test seeks to probe what you know about how your thoughts, feelings and functioning impact your actions and behavior (Psychology and Social Sciences section). Sounds complicated, doesn't it? Well, it is complicated. The science of life and the science of medicine are complicated. Medical technology and medical knowledge are exponentially expanding, and this further complicates what you already know about the science of life. The doctors of tomorrow need to have mental agility to cope with the fast-changing developments in science and technology and yet learn to deal with patients as people and not as mere medical conditions – that is what good doctors are supposed to do. And that is how good medical schools propose to train their students to become the doctors of the future. To help you prepare for the exam, Gold Standard MCAT has laid out comprehensive information on MCAT scores, topics covered, MCAT test dates, preparation advice and free MCAT sample questions.